Lamy pens are most well-known for the affordable battle-ready Safari and Al-Star lines, but Lamy is one of the few companies out there that is willing to break the mold and experiment with radical new designs (their Dialog 3 is a beauty!) and ideas … but you don’t always need to spend $400 to get a hip, new design! The proof is in the Lamy Nexx. The lightweight aluminum body is a rounded, triangular shape that makes for easy holding, with a tacky grip area that is also triangle-molded elastomer. The best part about the grip is that it is soft enough to cushion without being squishy and also a dust magnet. The pen body itself is supremely well machined and will be quite durable. The cap is heavy plastic with an aluminum clip that is secure, sturdy and features a lanyard hole. Although the cap looks bulky, it’s needed to balance the lightweight body of the pen when writing and you’ll notice that there’s very little weight in the hand and strain in the wrist when writing. Combine that with the standard Lamy steel nib (which is legendary for smoothness) and you’ve got a pen that you can write ALL DAY with. No joke! I’ve sat in seminars and written for a solid hour with this pen and had no cramps to speak of. The fatter barrel really does help in reducing hand fatigue and also allows people with larger hands to really feel comfortable. The only real downside for me is that a Lamy F is like a Japanese B nib, but that’s true for most Western vs. Eastern pens. I like to print graph paper from Incompetech.com or use graph notebooks with bigger squares and use this pen for seminar notes or brainstorming. The ink flow is so smooth and consistent that the pen doesn’t stop until you do. When you pair Lamy’s legendary ruggedness with a smooth nib and a VERY ergonomic body, you get a real innovation in the way that people write and Lamy has really outdone themselves with this pen. I’d recommend trying it out just to see for yourself how it feels to be able to write with no pressure or hand strain. This would also be excellent for people with tendonitis or wrist problems. Posted on March 26, 2012 by Brad Dowdy and filed under Fountain Pens, Lamy, Nexx, Pen Reviews. Am I getting heavy into fountain pens now? Not quite - I still don't use them on a daily (or even weekly) basis, but it is hard for me to pass up a new Lamy model. The Lamy Nexx Aluminum Fountain Pen is a recent addition to the ever expanding JetPens lineup, and comes in a few different flavors. My model has the orange cap with metal clip, and an extra fine nib (see all options here). My first impressions of this fountain pen is that is a design mashup of the AL-Star and Safari lines from Lamy. The Nexx has a nice aluminum barrel like the AL-Star, and a plastic cap like the Safari, which results in a more industrial look, as the product description puts it. The one thing that is different from both is that the grip area is a solid rubber as opposed to plastic. It is still molded in the triangular shape, but the rubber gives you a litte more security in the grip area. At the start, I only have the standard Lamy blue ink cartridge that came with the pen, but many other ink cartridges are available, and the Lamy Z 24 converter works with it as well. I'm a fan of the standard Lamy blue, and the EF nib in the Nexx actually seems a little smoother than the EF nib in my Charcoal Safari. 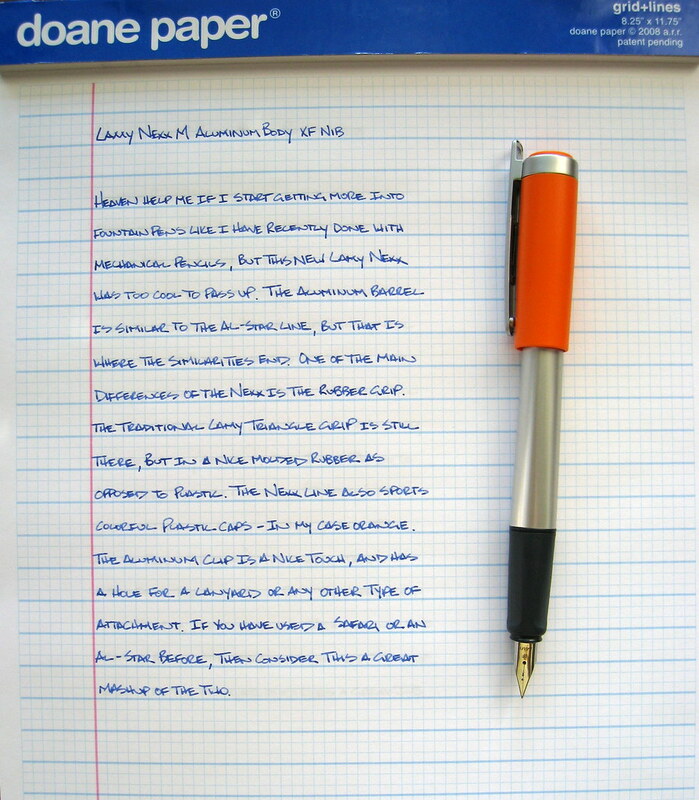 The Nexx is a great fountain pen for Lamy fans and for those looking for something different. Since I only have a Safari to compare it to my opinion is limited to those two, but gun to my head I will pick up my Safari first, but it is really close. Posted on October 13, 2010 by Brad Dowdy and filed under Fountain Pens, Lamy, Nexx, Pen Reviews.